Ashford (Middlesex) Camera Club is a friendly club whose aim is the enjoyment of photography. Membership is at all levels, from beginners to advanced, and although most of the club’s members produce digital images a few still expose and show results using silver halide film. 2nd competiton for prints plus PDI set-subject "Blue"
2007 was the 50th anniversary of the founding of Ashford Camera Club by Geoff Gould. 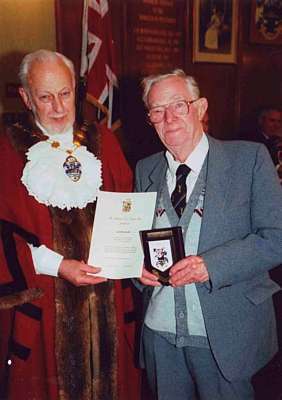 Geoff ran the club for 46 years, until his death in 2003. A year or so before he died he wrote some notes on the history of the club, the trophies presented to the winners of the club competitions and the personalities behind the trophies. Geoff’s notes are reproduced here. The notes end with the Club holding its meetings in the hall run by the Reedsfield Road Residents Association (RRRA). The Reedsfield Hall proved to be a satisfactory meeting place for many years, apart from some minor difficulties experienced by new members and visiting judges in finding the location! All good things come to an end and in late 2002 the Club was, once again, forced to look for new premises when it was clear that the hall was going to close. This time the Club found its present home, in St Matthew’s Church Hall in Muncaster Close. Membership is open to anyone with an interest in photography, whether they are beginners or advanced practitioners, using either film or digital equipment. * Potential new members are welcome to attend two 'sampler' meetings free of charge.